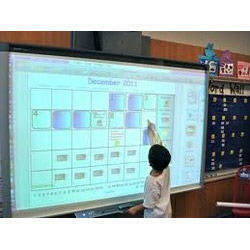 Leading Manufacturer of interactive board from Ambala. Owing to our prosperous industry experience and knowledge, we are manufacturing and exporting Interactive Board of utmost quality. This board is manufactured using excellent quality raw material and latest technology by our vendors. With the help of our trustworthy and specialized vendors who understand the requirement of customers, we are providing these products to our clients in standard as well as customized form. The offered products are widely used in classrooms, corporate board rooms and others & are mounted to a wall or floor stand. These products are available for our valuable customers at very reasonable prices.